Opposing Le Pen should in no way be limited to voting against her on May 7. Now that we know the French presidential election’s second round will set former banker and finance minister Emmanuel Macron against neofascist Marine Le Pen, where should the French left set its sights? The vote — as well as the legislative election that will follow in June — is unfolding amid a deep crisis of political representation that, alongside financial decline and growing violence, has turned the European Union into what Stathis Kouvelakis and others have termed global capitalism’s “weakest link.” Although these multiple crises are far from new, they have produced striking new developments that we need to analyze before mapping out possible next steps for a stronger political left. The coalition between center-left and center-right politicians, giving birth to the “extreme center,” has ruled Europe for some time now. It has become difficult to run the European Union and various nations without such an alliance. “Center” alone might hint at a moderation that is altogether absent from contemporary politics. Extreme center, in contrast, evokes the “no alternative,” neoliberal policies that have plagued the world for decades. In this light, Emmanuel Macron’s first-round (and likely second-round) victory loses some of its surprise. A former banker, Macron contributed to some of the worst neoliberal reforms of the last five years. Once incumbent François Hollande decided not to run for reelection and less-extreme-centrist Benoît Hamon won the Socialist Party primary in a surge of anti-government sentiment, Macron became the extreme center’s only viable candidate. What makes Macron’s success interesting is the fact that he belonged to the Fifth Republic’s least popular government. His platform closely imitates the Hollande presidency, and while Hollande’s historic decline in popularity once seemed to guarantee that right-wing candidate François Fillon would win this so-called change election, we will most likely end up with President Macron. Of course, most French citizens, even those who voted for him, do not think he will revolutionize French politics. Even in a strongly anti-incumbent election, the Socialist Party would have fared much better if Manuel Valls, Hollande’s prime minister, had won the primary. This explains why many members of the government endorsed Macron, who could also count on votes from Hollande’s remaining supporters. The extreme centrist also shaved a few points off Fillon’s vote share, as corruption scandals plagued the right-wing candidate’s campaign. Amid justified fears of the far right’s good showing, the media convinced a significant number of otherwise left-wing voters that supporting Macron in the first round represented the best — or even the only — chance of eliminating Marine Le Pen. Macron helped his case by hinting at his (virtually nonexistent) support for a more multicultural France. While Macron’s victory owes something to these other developments, it also confirms that, in a context of economic and social crisis, French society is split between those who want to reject the European Union and those who still hope for technocratic salvation. For all those reasons, neoliberal capitalism’s political representatives broke with the de facto two-party system, taking an anti-establishment pose and saving the extreme center — at least for now. However, this background points to some of the next administration’s likely weaknesses. What used to represent the Left (the Socialist Party) and the Right (the recently renamed Republicans) ended up with about 26 percent of the vote. 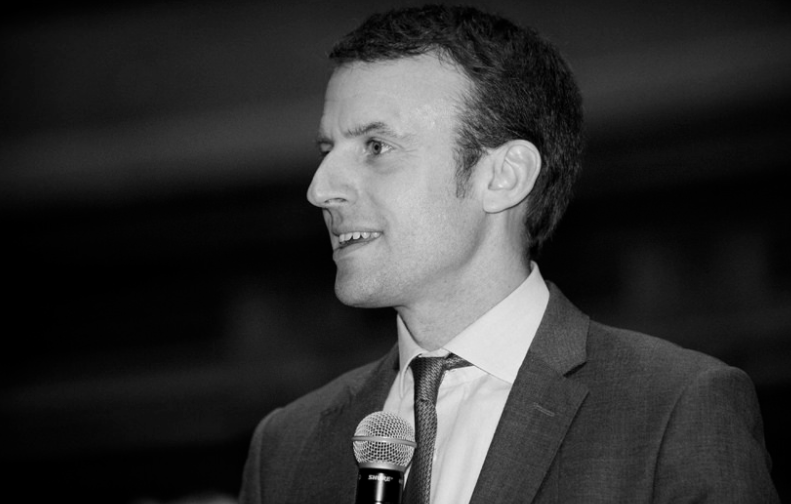 If we consider Macron part of the same section of the political spectrum — which used to constitute all or most of the spectrum — then the center’s total comes to about 50 percent. Moreover, the extreme center’s internal contradictions will return in June’s legislative elections. The center-right will try to get its revenge on center-left incumbents, and Macron will have to rely on those incumbents to build a coalition. Soon, his outsider status will disappear. Meanwhile, the structural, economic, and social factors that have plunged most European countries into this kind of political crisis will persist, further discrediting the neoliberal center. Macron appears, at best, as a temporary solution for capitalism and its political representatives; another way to buy time, which seems to be the only thing capitalists can do anymore. Meanwhile, the first round also saw the far-right National Front’s (FN) return to the second round, with Marine Le Pen following in her father’s footsteps. Unlike in 2002, however, the neofascists’ success came as no surprise, which further underlines the ongoing political crisis’s dangers. Le Pen’s second-place finish confirms that her “normalization strategy” has worked, both as a way to avoid being denounced as a fascist threat and to force the rest of the political spectrum onto her terrain. Throughout the election, the other mainstream candidates tried to woo FN voters by imitating Le Pen — “immigration is a problem,” “patriotism is the solution,” “France for French people.” As a result, the far right is now winning the race to lead the opposition to capital’s chief representatives, the embattled extreme center. For the Left, this seems like the most pressing issue. The difficulty lies not so much in identifying Le Pen and her party as the most dangerous enemy but in elaborating a successful plan to defeat them. We risk falling into the “anyone but Le Pen” trap, which the American left is already facing. As in the United States, the antidote is to take the far right’s specific threat seriously, combining a negative (anti-Le Pen) campaign with a positive left project, absolutely independent from the neoliberal center. Many commentators have already noted the similarities between a Macron–Le Pen second round and last year’s Clinton-Trump match-up. To a certain extent, however, we might more accurately describe Macron and Le Pen as the two faces of Trump: Le Pen does not have the endorsement of an establishment party and is ultimately a reloaded fascist, a definition that fits only some of Trump’s followers; Macron has been able to frame himself as a political-outsider/business-insider, and will use this maverick profile to carry out the same old neoliberal policies. The slogan expresses radical opposition to both neoliberalism and neofascism and is usually associated with calls for street mobilizations and direct action. However, it seems difficult to build a mass left opposition without recognizing the immediate danger posed by broad support for fascist politicians. Opposing Le Pen should in no way be limited to voting against her on May 7. It should include preparations for the biggest May Day rallies possible that unite traditional labor demands with an urgent antifascist and antiracist stance. But can the Left afford to leave the antifascist vote to others? Clearly, this slogan would have less popularity if Macron’s victory did not appear as a done deal. But we may reach the opposite conclusion as well: Macron’s all-but-certain victory means we can call for immediate opposition to Le Pen both in the streets and in the ballot box without holding back in our denunciations of everything Macron stands for. In the end, the slogan correctly points out where the chief responsibility for Le Pen’s success lies. We would not find ourselves in this mess if it weren’t for decades of neoliberal policies enforced by alternating poles of a two-party system, making clear that “there is no alternative.” Which is why, faced with a false choice between the extreme center’s champion and his fascist challenger, we must build an antifascist movement that doesn’t join with the increasingly discredited representatives of the neoliberal status quo. If anything, “Macron 2017 = Le Pen 2022” sounds like the ticking of a time bomb. In addition to pointing out the extreme center’s responsibility for the return of fascists, it also underlines what the Left must do: build a powerful, united movement, independent from the so-called left government of the last five years. Above all, this resurgent left must refuse to oppose Le Pen by imitating her “patriotic” language or putting the antiracist movement on the back burner. The good news is that the Left almost gathered as many votes as Le Pen this time, most of which were votes for Jean-Luc Mélenchon. As useful as the far-left campaigns of Philippe Poutou and Nathalie Arthaud were in bringing up key issues and attacking status quo candidates, they openly admitted that for them this election was merely an opportunity to spread ideas. Mélenchon insisted that an electoral victory, or even just a very successful campaign, would be a crucial contribution to a deep transformation of society, and encourage the mass mobilizations which such a transformation would require. That Mélenchon took such a stance while remaining independent from the Socialist Party, and came close to reaching the second round, should indeed energize us all. Moreover, the Mélenchon campaign was able to help the Left make some progress in strategic debates about the European Union. Mélenchon put forward “plan A” (renegotiating the main treaties making the European Union the neoliberal machine that it is) and “plan B” (being prepared to leave the European Union it if turns out to be the only way not to give in to neoliberalism), a didactic and unifying approach to a crucial debate in which the Left too often stuck to something like “plan A or bust” (even after Syriza did just that in Greece, with devastating results). But the way forward for the Left is also through an earnest debate about the Mélenchon campaign’s own major shortcomings. Despite a good platform on issues of democracy, France Insoumise did not set a good standard of internal democratic practices on the Left. Nor did it challenge the worst aspects of republicanism on the French left, especially as it relates to not foregrounding the struggle for immigrant rights and international solidarity, fighting police brutality and anti-Muslim “secular” laws. Still, we should draw hope from Sunday and the starting point it gives us for the struggles to come. Mathieu Bonzom is a member of the editorial board of online socialist magazine Contretemps , and works as an academic in France, studying racism, hegemony, and social movements in US society.